April is oral cancer awareness month, and we’d like to bring some facts to your attention that you may not know. While there isn’t a huge spotlight on oral cancer, it is actually responsible for one death every hour of every day. It will also affect close to 50,000 Americans this year alone, half of which will not be alive in the next five years. So even though we don’t hear that much about it, oral cancer is serious, and it’s numbers really haven’t improved over the years. This is due to late diagnosis, and why your dentist in Medford is reminding you not to miss your oral cancer screening! Oral cancer is the type of cancer that manifests in the head and neck region, excluding the brain, which has its own category of cancer. Oral cancer can be tricky to diagnose on your own, as it doesn’t typically cause much pain in its early stages. This is why it’s often diagnosed too late, when it’s already moved to other critical areas of your body such as your lymph nodes, making your prognosis less positive. It also has a high rate of reoccurrence, meaning that if you had oral cancer in the past, you’re more likely to develop it again. 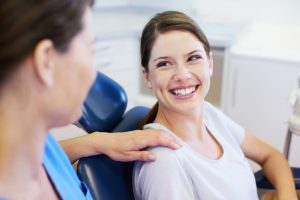 This is why consistent routine check-ups with your dentist are so critical, as he can diagnose oral cancer much earlier than you can, giving you a better chance of a successful treatment and recovery. If you notice any changes to your oral health, it’s a good idea to contact Giamberardino Dental Care right away for an examination. Preventive care is truly your first line of defense against issues like oral cancer and gum disease. Dr. Giamberardino will screen you for these concerns at your six-month checkups and this gives you the best chance of a successful treatment with a less invasive procedure. Is it time for your next cleaning and check-up? Your health is too important to ignore! Give your family dentist in Medford a call today to schedule your next appointment.